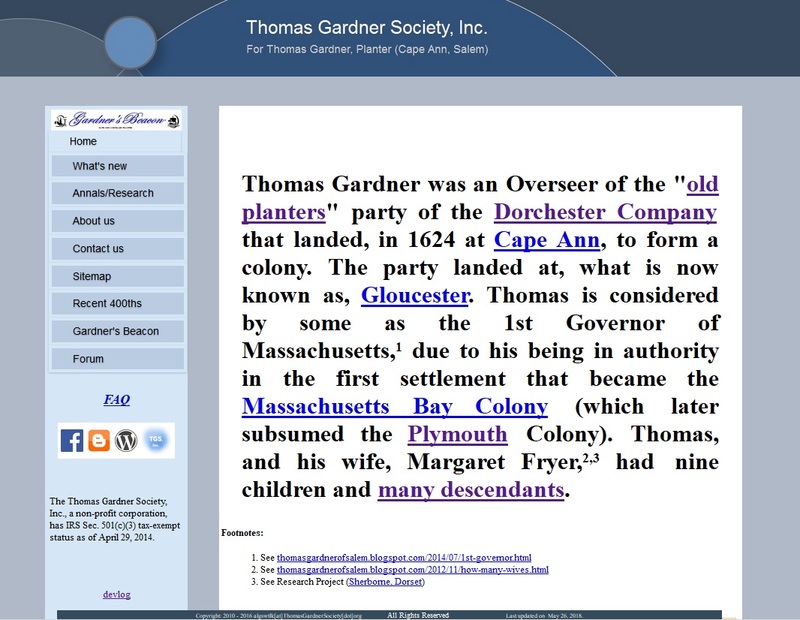 John Gardner was a son of Thomas and Margaret who was born at Cape Ann in pre-Conant times (1624). 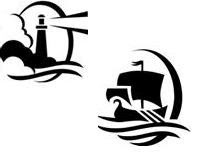 We have mentioned him a few times, such as for his roles in Nantucket, but he also was involved with Essex County and Massachusetts. In 1638, Gov. 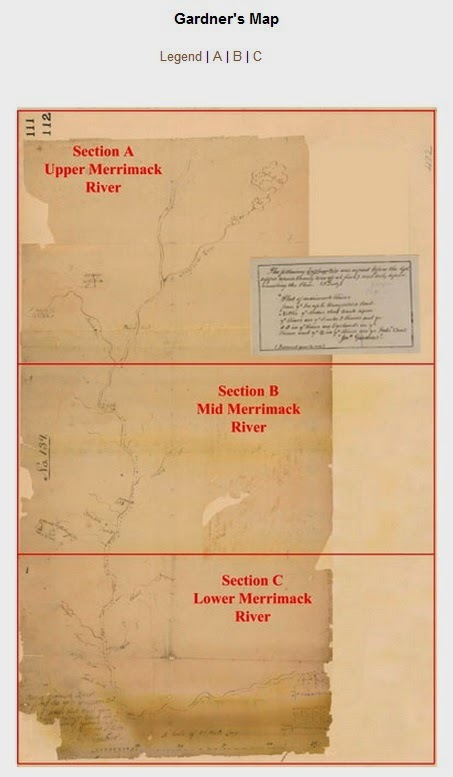 John Winthrop wanted a survey of the Merrimack River. Nathaniel Woodward (NEHGR, Vol. 51, 1897), a mathematician and surveyor, led the effort. John Gardner was part of the crew (Browne, G.W. (1906) "The Merrimack River: Story of its First Survey" Granite State Magazine, Vol. 1, p 133). Later, John annotated a copy of the map that was drawn using survey results. See the image which can be found at Native American Deeds (John's signature is on Section C) which was accessed from Salem Deeds. John would have been young, of apprentice age, but this had to be a good experience. Dr. Frank (1907, pg 52) wrote that he "was first mentioned in the records of the 'General Court' at Boston" when the treasurer was "ordered to pay John Gardner ... for witness charge & carrying Goodman Woodward, his instruments to Ipswich." This crew's map was used until 1652's effort at determining the northern extent of Massachusetts. Note: I ran across the map while researching another topic involved with Ipswich. One intent is to gather as much as is available, and can be found, for each person of the 1st generation. Then, providing a persistent means for presentation is (will continue to be) on the table. 07/27/2014 - In 1638, there was a Harvard class in progress. From the viewpoint of effectiveness required for successful establishment of a community, one can, easily IMHO, ask whether John's experience might have some, a lot IMHO, advantages over the classroom discussions related to the number of angels on a pin head (sorry, had to write that)? This is an age-old argument, very much apropos to some modern problems. We expect to address this topic, and related topics, again. For now, look at Staloff's book (see preview at Google books): The Making of an American Thinking Class (oh Lord, deliver us). I have mentioned him several times in posts. I would take 100 Thomas' as backbones and brains over any intellectual as would anyone who has to deal with reality and problems that have to be HANDled. 06/06/2015 -- Given the day, an aside: Harvard contributed, relatively in size, manpower for both WWI and WWII. In some ways, it's astonishing that the likes involved currently (and their whole worldview) is supported by those who put their lives on the line daily and not by the ilk (we can discuss this from a historical view, please). ... The school has also just picked up oodles of money which has caused some controversy. None here, as the money could go toward making their upcoming 400th more pertinent to the American (and the dream for many - say, Magna Carta) experience, as a whole. ... Another aside: John Gardner, being young, may have provided the muscle for the crew, but that type of experience is missing from the lives of many who go to the supreme, supposed (similar ilk from all over the world is attracted), academic environment (say, for instance, a draft and real contributions thereby - see above). ... Finally, the view here is not colored by the fact of being an in-law to descendants of the first head (whole tale ought to be re-visited with all sides represented). 12/12/2018 -- Fixed link to the map which came from Native American Deeds. This post goes along with our efforts at organizing all of the material that has been collected. For one thing, we expect to have the bibliography documented more extensively than what we have done so far. For many topics, we want to have an annals unfolding of the discussion. Gardner's Beacon, Vol. II, No. 6 - Issue, Post, is an example. Today, I got to reading Hutchinson's work (Vol. I, Vol. II) that he finished after going back to England (as a Loyalist). He, of course, had Hubbard's manuscript which we almost lost due to fire (and riot). That would have been a real disaster for the Gardner viewpoint, as Rev. William Hubbard was the first to write (we will check this - was Cpt. Johnson, first? ); and he had talked to all of the principals (Rev. William's work was published in the early 1800s over 160 years after he did his work). And, we can see how extensively Rev. William talks about the early years (as in, pre-1620 - see Gardner's Beacon, Vol. III, No. 1 - Issue, Post). Let's look at one little item. If one asks the question (Who was the first Governor of Massachusetts? ), the most general answer will be John Winthrop who came over in 1630. Others, who might be more considerate of specifics, will answer John Endecott since he had a Royal charter in 1629. 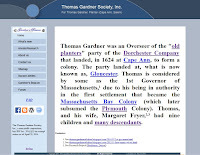 For more information, look at Wikipedia which has a nice list of colonial governors of Massachusetts. Now, considering Plymouth, one can add John Carver at the top. However, what about George Popham? The Popham effort was successful in many ways and was thirteen years prior to the advent of the Mayflower Compact. Then, we get to Ferdinando Gorges who supported Popham. He, and his son, Robert, were involved with several attempts. We must not hold that they moved locations against them. That was the reality in Virginia, too. And, the Cape Ann crew moved. Now, speaking of which, some might say, Roger Conant. 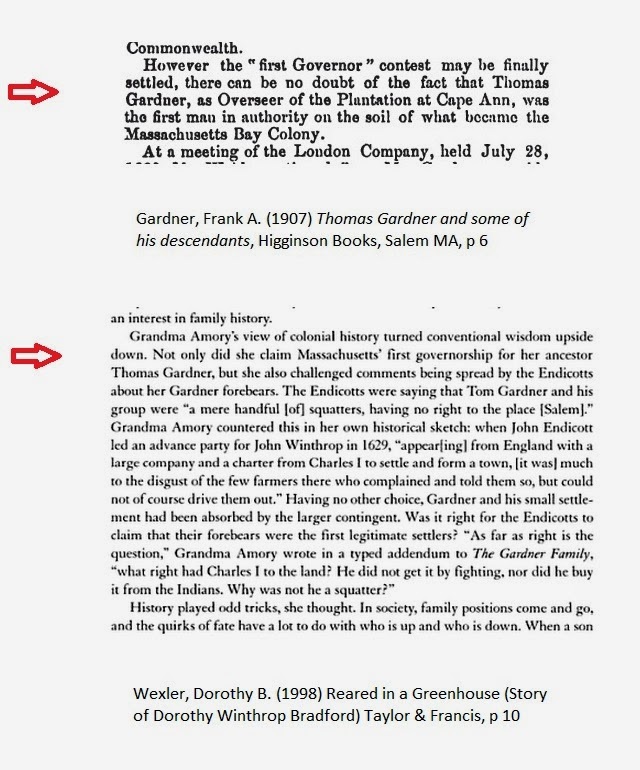 This is mentioned in the family book (note that this link goes to their discussion of what we called Margaret's house - Gardner's Beacon, Vol. II, No. 4 - Issue, Post - Note: there is no mention of Thomas Gardner). Rev. William talked about Roger's lament of being ignored (-- future post -- this quote plus the late 1800s meeting that included the noted descendants, such as William Crowinshield Endicott, Jr, Henry Cabot Lodge, and others). Now, in his book, Dr. Frank touches upon this, very briefly. But, in a section of Vol. II, No. 6, there is a look at the original source: Elizabeth Gardner Amory. Elizabeth's granddaughter, Dorothy Winthrop Bradford, writes about discussions with her. The image is from the book, Reared in a Greenhouse (preview mode at Google books) by Dorothy B. Wexler. The time frame to which Elizabeth refers would be (say) post-US-Civil War. Elizabeth claims to have been the first to make this statement about the first governor. Her discussion about the matter is on page 10 (see image). This little example is one of many. The recent book about how "invisibles" hold the world together offers a few modern concepts that can be useful as we proceed with further analysis (more later - but, there is no shadow nor is there any lament). 07/22/2014 - Captain Edward Johnson published, in London, in 1654. His book was redone, in Andover, MA, in 1867 (this is in the collection for the bibliography). ... How could I not mention Higginson whose comment about Endecott's house lives on? 07/23/2014 - Read a little more of the book. Interesting. Added Elizabeth to the descendants list (Wikipedia, which has a page for the Dudley-Winthrop family). This list will be getting more attention; the last exercise got rid of stale and suspect links. We will reorganize (with the intent to foster analysis and discussion) and add more descendants (we need more of Miriam's progeny, for example). 03/02/2019 -- We are building an index of images at our portal to truth. We have started a Facebook page which is public (for now) to promote the interest. Please visit and comment. This is an informational page. As the interest grows, we can take the matters to a private by invitation (or other type of) group. At that point, we could get more into the current genealogical studies. If the access, for some material, ought to be in Facebook only and not public, please let us know. The Forum, started in 2013 at the TGS site, is being retired. Gardner's Beacon, Vol. IV, No. 2, will provide a recap of activities, look at some of the details of the recent incorporation, touch upon goals, and consider a timeline of the Magna Charta (there was recent celebration of the 799th anniversary of the first (of 45 or so) sealing) as it relates to the colonies.